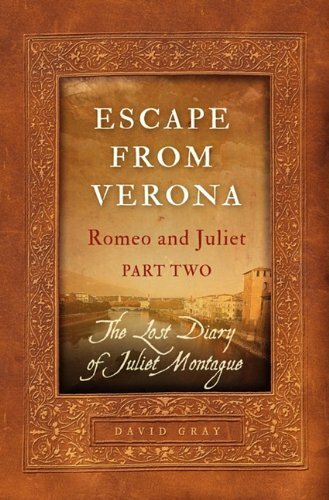 Escape From Verona, Juliet's long-lost diary, begins where Shakespeare leaves off, explaining how she and Romeo fake their deaths and escape from the Capulet family tomb. Their escape does not bring peace to Verona. They are accused of murder and witchcraft and are hunted by powerful forces, including the Papacy and the Venetian government. Their adventures require not only eluding capture, but they must also learn what it means to love one another without the backdrop of their family feud. What sacrifices are required for a well-bred young woman and a proud young swordsman to survive together? Is heedless passion enough to make their marriage last? This is a book that had great potential, but that didn't quite live up to my expectations. The idea behind the story (Romeo and Juliet surviving and attempting to escape together) was what enticed me to request this book from NetGalley. The hints at the inclusion of other Shakespearean characters and historical figures was also a big draw. Sadly, I found myself reading the book with very little enthusiasm. Juliet came across as too experienced for me, and I found some of her actions completely unbelievable. Meanwhile, Romeo spent most of the book sulking and telling Juliet her ideas were worthless. Many of the events and actions seemed far-fetched and the dialogue was stilted and dull. The reason this book got three stars and not two, was that the inclusion of the characters from other plays into the plot worked well and I consider that element of the book to be fairly enjoyable. But even so, I found myself constantly glancing at the screen to see how many pages I still had left before I could start something else. I'm sure this book will appeal to plenty of people; but it just didn't suit my tastes. I would recommend this book to those who like the play and are not looking for anything more than an amusing adventure story in this sequel.